Yawn! Here comes the latest entry to the tired ‘found footage’ horror canon. Another low budget, purportedly homemade, schlocky fright-fest canon, this one is directed by…hang on…Barry Levinson!?!? You’d be forgiven for not seeing this one coming but, with The Bay, the Oscar-winning director of Rain Man and Sleepers takes an unexpected, leftfield turn into grisly horror territory. This chronicle of the terrifying chaos that breaks out in a small Maryland seaside town following a gut-churning ecological disaster on Fourth of July Weekend, bears little similarity to anything Levinson has done before. Yet, satisfyingly, it manages to stand head and shoulders above the majority of the dime-a-dozen shockumentaries it looks to emulate. This may, in no small part, be due to the involvement of Paranormal Activity creator Oren Peli, who oversees as producer on an ingenious little picture that cracks the formula to truly make the flesh crawl. 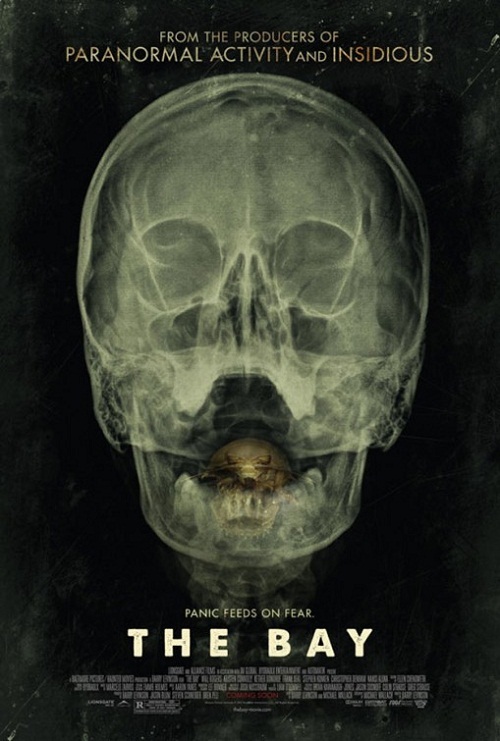 Presented as a collage of ‘genuine’ footage gathered by Kether Donohue’s spunky rookie news blogger Donna, in its recounting of a deadly water-borne plague that turns its victims into hosts for horrific creepy-crawlies, The Bay cleverly avoids the major pitfall that blemishes most ‘found footage’ shockers. Whereas flicks like Cloverfield and REC enter the realm of dunderheaded contrivance due to their characters’ insistence on filming absolutely everything, when any sane person would be heading for the hills, Levinson’s picture cannily chronicles the outbreak of tongue-devouring isopods by covering it from multiple angles, revealing a host of divergent, gruesome stories. This smart plot device, weaving in all manner of multimedia footage from home videos, police radio, blogs, news footage, even camera phones, helps to create a deft, multi-layered narrative that gives the impression that the events taking place are truly catastrophic and far-reaching. As footage of happy families enjoying the summer celebrations abruptly gives way to close-ups of festering boils erupting in geysers of goo and unfortunate wretches vomiting up their own insides, The Bay’s residents don’t hang about, hastily tossing their cameras aside while doing a whole load of screaming. This allows the director to show us only fleeting glimpses of the terror, capturing the sense of panic and planting seeds of fear, before cutting to the next set-piece of hazily filmed, gross-out terror. An eco-warrior’s blog, unearthed videos of scientific findings, and an infected teenage girl’s FaceTime conversations are just a few of the inventive, enlightening vignettes that help to shed more light on the gleefully twisted narrative. It’s canny filmmaking, acknowledging the fact that, nowadays, everyone is filming everybody else, and that the multitude of ways in which information is now transmitted offers Hollywood a veritable treasure trove of new opportunities to scare its audience’s pants off. This is almost certainly the first film to show us a gruesome death via the medium of Skype. You wouldn’t bet on it being the last, such is its eerie effectiveness. Where Levinson’s picture truly terrifies though, is in its relative plausibility. As the stricken town descends into total, creepy-crawly-infested anarchy, the effect of realism created by the use of unknown actors and home video footage lull us into believing that this could really happen and that, even worse, no hero will emerge to save the day. This is a film about widespread fear and panic that poses uncomfortable questions about how we, as a society, might handle such a situation, were it to suddenly occur. A feeling of hopelessness encroaches, as pencil pushing bureaucrats dither in far-away offices, while stumped doctors start to amputate limbs with no Plan B. More than an effective chiller, Levinson unleashes a scathing, intelligent allegory for the way the U.S. government deals with the fallout of natural disasters. The creepy air of despondence is further aided by some dexterous sound editing, as spine-tingling, distant, echoing screams become audible in Donna’s progressively urgent newscasts, the wailing eventually growing to near-deafening volume. However, the inclusion of a tense, dramatic musical score seriously undermines the idea that this is a genuine documentary. Though this is a tool that many American documentaries now appear to implement, it feels as though Levinson doesn’t fully trust his audience’s intelligence, insinuating that we need these musical cues to let us know when to feel afraid. The Bay is also slightly led down by Donohue’s moderately irritating central turn as the fledgling hack, whose whiney, over-earnest voiceover and general ditzyness quickly begin to grate. However, the film does benefit greatly from a whole host of very believable, naturalistic performances from its expansive cast, giving credence to its ‘faux-documentary’ credentials. Though disarmingly believable at times, the plot occasionally verges on the ridiculous, particularly when it is suggested that these events have somehow been ‘covered up,’ necessitating this expose documentary. The vast array of far-reaching multimedia that the film not only celebrates, but depends on, would surely render this impossible, but Levinson just about cheekily gets away with it. The Bay is artfully crafted, a successful exercise in blending various disparate, intermedia elements into a freaky, unique, cinematic patchwork of nightmares. Levinson proves his move into horror is no flight of fancy, casting an ominously effective spell and delivering an affecting assault on the senses that manages to be indelibly frightening while doing something blisteringly original with a well-worn format. Next Post The Michael Bay Ninja Turtles Casting Game!